Activities at Volcanoes National Park Vacation Rentals is minutes away from Volcanoes National Park of Hawaii, which is the home to two active volcanoes. How many people do you know who have actually seen a Live Volcano?? You have the opportunity to visit this National Park and see molten lava flowing into the sea…walk on lava beds and see the steam coming out of the core of our Planet. You can visit the Jagger Museum and learn all about volcanoes and at night go outside the Museum and watch the white glow of steam coming out of a volcano. As the water droplets whirl into the air, they reflect the red glow of the volcano where the lava gets to over 2000 degrees Fahrenheit! 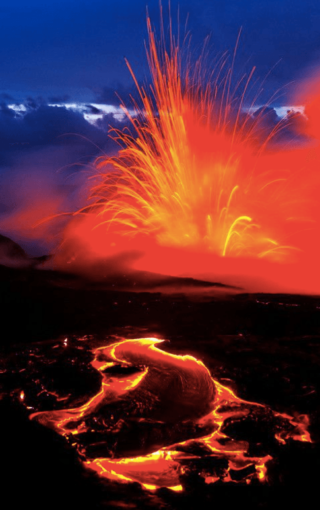 When I first moved here, I knew about the volcanoes, but didn’t think much of it until I was driving home from Kona one night and witnessed the huge volcano crater, about a half-mile wide, spewing out steam and you could see the red glow from miles away! While you’re at Volcano Park Rentals make sure you take time to visit one of Nature’s Wonders! The Jaggar Museum, named after the famous geologist Thomas Jagger , is one of the “must see” places to visit while you are staying at the Volcano Park Rentals. Located inside the Hawaii Volcanoes National Park, the museum itself is open till 8 pm. Make sure to watch some of the videos that are playing. Then come back at night and watch the active volcano spewing out steam from the center of the earth! The molten lava reaches temperatures of over 2020 degrees Fahrenheit and the water droplets from the steam reflect the red-hot lava to create an amazing vision that will stay with you forever! – View of Mauna Ulu on left and Pu’u Hulululu to the left of it. 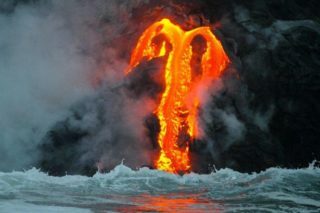 – Muliwai a Pele: Stunning 5-mile long “muliwai” – or river of lava. village of Kealakomo, which was buried in a 1971 lava flow. – Alanui Kahiko: Cool – old highway that was covered by lava in 1972.